I have wonderful news, this past weekend I watched Cholita, the ex-circus bear rescued by ADI, taking her first steps into her new jungle habitat in the Peruvian Amazon, on the edge of her native Cloud Forest. Cholita is home, back where she belongs. We traveled a thousand miles across Peru, over the Andes, freezing at high altitude, crossing deserts and through lush rainforest. For three days we only stopped for fuel, food and animal feedings; we slept in our cars and kept on going. On the fourth day, Cholita and Mufasa were transferred to travel cages, while the monkeys and James were loaded in their Sky kennels onto a boat for a remarkable Noah’s Ark type ride along the Madre de Dios River! We were exhausted – but as Cholita stepped out, nuzzled and licked the ground, checked out her pool and cave, explored her forest home, reached up trees, tasted leaves, and looked for insects under logs, it was all worth it. Thank you, so very much, for making this possible! The scars of Cholita’s abusive past at the circus are clear to see – her fingers were brutally cut down to stumps and her teeth were broken, leaving her defenceless. 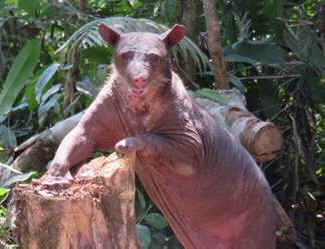 Elderly Cholita is barely recognisable as an endangered Spectacled Bear because she is suffering from severe hair-loss. 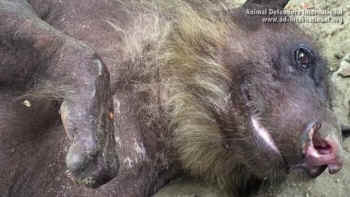 Where she should have thick, black fur she has none, leaving her almost completely bald.